But while WND.com World Net Daily claims to be in search of the truth, they are not telling the truth about where their Tea Party at Sea cruise is heading. The Tea Partiers will be frolicking on a beach in Haiti – protected from the starving Haitian children by layers of barbed wire and shotgun-toting guards. Where do the Tea-Partiers think they are headed? “Labalee, Hispaniola” doan ya know! We sent an email to Mr. Farah and WND last Thursday, but so far we’ve had no response. If WND replies we’ll certainly publish their position in a prominent manner. 1/ The Tea Party at Sea cruise is heading to a shotgun-protected, barbed-wire surrounded private beach in earthquake-devastated Haiti. 2/ For almost 25 years Royal Caribbean and corrupt Haitian leadership have exploited this natural area while providing few appreciable benefits to ordinary Haitians. Not so much as a single medical clinic or school has been built by Royal Caribbean for the ordinary people on the outside of the barbed wire. 3/ The original agreement and pricing was set in place under the corrupt Duvalier regime and remains largely unchanged to this day. That says something. Taken from WND's "Tea Party at Sea" website where the word "Haiti" is never mentioned. While researching our continuing series of articles about Haiti after the devastating earthquake, Barbados Free Press came across a web advertisement for your Tea Party at Sea cruise that advertises “Hispaniola” as one of the cruise stops. Although we disagree with many of WND’s articles and agendas we respect your tenacity and usual unwillingness to surrender to political correctness – traits that Barbados Free Press shares as we pursue our own editorial policies and subjects. That’s why we were surprised to see WND’s less than forthright presentation about your Tea Party at Sea’s Haiti beach destination. We believe that World Net Daily’s readers and prospective cruise passengers deserve to know the truth about their private beach in Haiti, its origin under an agreement between Royal Caribbean and the despotic Duvalier regime, its history – and what level of benefits are actually brought to ordinary Haitians under the current operational agreement with Royal Caribbean. Barbados Free Press also believes that if your readers and cruise passengers become aware that they are heading for Haiti, they might take an increased interest in the desperate situation that lies just beyond the foliage, barbed wire fence and shotgun-toting guards that conceal the real Haiti from “Royal Caribbean’s private paradise” as your advert puts it. Bye the way, Mr. Farah: we are disgusted with the refusal of our Barbados Government to accept ANY Haitians for lifesaving medical treatments or rehabilitation as requested of Barbados by the United States. We know and appreciate that the USA continues to be the leader in delivering aid to Haiti. Nor have we forgotten that American rescue teams selflessly dropped everything and came to Barbados when we needed help with a family trapped in a cave-in. “There are only two entities that had the ability to deliver major quantities of food, water, medical supplies and shelter to the Haitian people during the first week of the disaster: The United States military and the Caribbean Cruise Ship industry. President Obama waved his hand and the might of the United States headed for Haiti. American Special forces teams secured the airport within hours of the earthquake and the airplanes started to arrive shortly thereafter. The US Navy and their helicopters started to arrive before sun-up the next day and a carrier group arrived on day 2. Attached are some of our previous articles about Haiti and Royal Caribbean’s operations at Labadee. Over the years World Net Daily has published many articles about the failure of Haiti to progress. Perhaps some of our pieces (and especially the blog of missionaries Licia & Enoch Betor who run a medical clinic and orphanage in Haiti) will provide additional perspective for you and your readers. We look forward to seeing World Net Daily’s revised “Tea Party at Sea” advertisements and a WND article clarifying the actual Tea Party Cruise destination as a private beach in Haiti. Since January 1996 Barbados Free Press has been the leading political blog on the island with over seven million visitors logged in the last four years. Our skin colours range from pink to very dark brown and two of us are married with mixie children. BFP is mostly (but not always) anonymously written and is concerned primarily with exposing Barbados government corruption, waste and errors. We call for reforms in Barbados including Integrity, Transparency and Accountability Legislation as well as environmental legislation and Freedom of the Press. We do not support either the current DLP or past BLP governments. BFP supported Barrack Obama’s presidential campaign editorially and continues to support the majority of President Obama’s efforts. While we disagree with World Net Daily on President Obama and gay rights, as our articles show we agree with WND on the threats from Islamist fascism, the communist Chinese and other despots, government censorship and corruption. BFP is solidly Right to Life. February 13, 2010 Was the US charge d’affaires surprised by Barbados’ refusal to look after Haitian injured? February 10, 2010 Barbados refuses request to look after injured Haitians. “Even one is too many for our health care system” says Bajan Foreign Minister. January 14, 2010 Haiti destroyed – How many new Haitian Immigrants is Barbados willing to take? These are the same people who promoted little or no regulation of the financial markets and their security instruments thereby casting the world into a worldwide credit crisis and a near second Great Depression. These are the same creatures who stood in the way of a revised health care budget that would permit a 5% public option. Nearly all, if not all industrialized countries have a public option. While they argue for greater tax responsibility, they can’t seem to figure out that the reason the US has had to seriously prime the pump of government spending is directly related to the private interest interests and loonies who put them in the position the US now finds itself trying to claw its way out of the hole. Maybe these people are approaching Haiian shores as they see Haiti as an ideal free market system where no rules apply and corruption reigns supreme. Obama is doing a remarkable job considering the odds and interest groups stacked against him and his team. I find this very interesting (if it as you say a Republican/ Conservative) device. I was born in the early 70’s in the US I have a Masters Degree, and I consider myself to be liberally educated. I’ll be the first to admit that I had no basic knowledge of Haiti, until the earth quake, only a very negative perception. I have no idea where I picked this up, I would venture to guess the media. I am ashamed to say I had no concept of it being attached to the DR, no idea how many people lived there, no idea how beautiful it is there. Hmmm… proved what the BFP article say. The cruise line use Hispaniola and Labadee names because the tourists don’t know where it is and that it is Haiti. Haiti has a negative marketing feeling and the cruise line invented the word “Labadee” to call Haiti something else. Isn’t is sad there are so many ignorant people believing the lies being told to them about President Obama! I read about the cruise online a while ago. Also if those same people don’t know their geography and where they are or are not going… what does that say? I am glad they won’t be stopping here in Barbados. What a waste of money and for what! To promote more hatred and stupid behaviour. I wonder if these people have a clue that they and the rest of the tea partiers are the laughing stock of the entire world! What an embarassment. They have no idea how lucky they are to have President Obama as the leader of their nation. Just think if the Alaskan princess and the old guy had won the election.. I shudder to even think about that one! I hope these fools do not get a lot of press coverage because that is exactly what they want! Sorry cq8.. the fact that the tourists paying thousands of dollars to go on a cruise having no idea where Haiti is, is not only ignorant, but pathetic! The cruise line inventing something else to call Haiti is an insult to history and the people of Haiti! Well look who you are dealing with I suppose. People who thrive on hatred and racism! That cruise line should be charged with discrimination and anything else a good set of legal minds can find! Most disgusting and distressing! I really don’t see the point in any of this. Do you really and truly think that the “average” tourist really cares where he/she is going on a cruise? Some probably don’t even set foot on land – and why should they? A cruise ship today is like a floating city, a controlled environment, lots of good food and entertainment. They are simply looking for a getaway from the rigours of daily life. And – technically Haiti is Hispaniola. Now, what do I personally think of cruise ships? I think they are a bad bad idea! They are nothing but polluters of the planet and an extravagance, similar to all those wonderful condos being built on the most advantageous sites. But they all indirectly put money into our pockets. We are selling our souls to the devil! The entire island was and still is the island of Hispaniola. Haiti and the Dominican Republic are the two countries on the island of Hispaniola so it is not a factual error. We all know that it is a marketing sleight of hand ploy but so what. Royal Caribbean is in the business of selling cruises and they will advertise in the way most beneficial to them. Its not their fault if Americans don’t know basic geography or are to lazy to Google Hispaniola or just don’t give a damn. Finally Royal Caribbean has no obligation to build hospitals or schools . That is the most folly I ever heard. That responsibility belongs to the Government. How many schools BS&T build here in Barbados? Simpson? COW? Lime? BL&P Holdings? Think before you spew idiocy man. To both Duppy and Bad Man… I think you missed my point completely. The fact that a cruise that is like a charter event is even happening using the cruise as bait to get the idiots on there in the first place is sad. Then to give them a bunch of lies and attempt if it has not happened already, to brain wash them further into more hatred of President Obama etc… Also the fact that the people on the cruise you imply have no idea or care where they are going.. A get away?? I don’t think so! This cruise is set up purposely to brain wash and recruit ignorant people with money or people with very little money to go on some fake get away cruise.. It is just like the time share concept! bait them then go for as much of their money as you can! The whole thing is an insult and rude! Personally I would not consider going on any vacation without first knowing the places I was visiting. To not know is completely stupid. The cruise arranged is pure evil and nothing good will come out of it at all.. so Haiti is better off NOT having them visit their country. That kind of sick disgusting behaviour is being monitored by normal healthy authorities because when they get back to the States.. you can bet they will be watched for further disruptions, personal attacks against President Obama and others in the Democratic party.. Check the news out and see how many death threats are being made public now compared to before. This group is a dangerous evil bunch of criminals and they will take anyone they can get into their lair! My points go far beyond ignorant people not knowing where they are going on a cruise.. This tea party group are dangerous individuals with evil intentions.. Believe it or not, care or not. I find that the entire reason for all the major problems being caused by the people that hate for a life cause just cannot get over the fact that President Obama happens to be a black man. There is so much rasism in the USA it is insane. Hmmm, the fact you were born in the States in the seventies and did not know anything about Haiti until the earthquake is appauling and proves the stats on where the USA education standards are.. You are at the lower end of the education standards in the world! Pretty sad for such a big powerful country not to teach children about all the countries of the world during the 12 years of school they spend if they even bother to attend school. Do you not teach history or geography or world economy in any of your education there from 1st grade on up to 12th? omg.. that explains the level of ignorance with so many people from there..
Nite2day, we are taught history as it relates to Eastern Europe and the US, other countries as an aside as they dovetail into that history. Forget about women’s history. I even experienced this in studying art history, no Asian art, no African art, no contemporary Islamic art, certainly no Caribbean art. Unfortunately ignorance breeds closed mindedness–I count myself lucky in that I can go out and be open to seek the knowledge. Hey folks !! News Flash!!! Many people in the USA are not very familiar with the islands that make up the Caribbean, heck they are not even familiar with one of the countries that shares a common border with USA- Canada-. I have been on a Royal Caribbean cruise- not to “Labadee” and I believe the “Labadee” fiction exists to recoup even more money from the “cruisers”. If the guests disembark they will have to pay Royal Caribbean to use the amenities, purchase souvenirs etc. Royal Caribbean is all about making money, they always have their hands in your pocket. A cruise itinerary that includes Labadee may also include Jamaica, so the “Partiers” may also enjoy Dunns River Falls – if they disembark. Anyway to quell the notion that all “Tea Partiers” are white here is an article from the Globe & Mail. Hmmm I think that because of the lack of information taught in schools in the USA, that it most likely is a contributing factor the the enormous level of ignorance going on there today. Look at their politics. What a mess and all the nastiest people are jumping out of the woodwork to cause so much trouble for the entire nation! What an embarassment. The Americans do not deserve President Obama, he is too good for them! Sargeant.. thanks for your input. Yes you are right.. they have no clue about Canada at all! But maybe now that the winter Olympics were held there they might just clue in now if they were bright enough to even watch the games. Sorry for being so harsh, but come on.. tea parties etc?? I could care less what color a person is, if they want to belong to an evil group such as this.. that is their problem.. Just don’t make it the problem for the rest of humanity!! I am surprised they aren’t all running around with hoods on and burning crosses.. although I am sure that will come very soon the way things are going there!! very disturbing!! As for the cruise for the tea partiers?? From what was shown on tv, there will be plenty of garbage for them to purchase.. t shirts, and anything else you can think of.. This is a total rip off marketing ploy to bait people, get their money before they can blink an eye.. plus as a bonus, brain washing is high on the priorities.. Reel in the stupid ones.. get their money and send them on their way home more full of hate than they had before the cruise.. oh well just hope they don’t show up here! Great article Barbados Free Press! 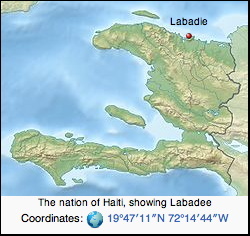 By the way, “Labadee®” is a name that Royal Caribbean trademarked as a variation of the French slave owner Marquis de La’Badie who settled in Haiti in the 1600’s. Its beyond irony that the tea party “patriots” will be trash talking our first black president while sailing to a resort named after a slave owner on a cruise ship operated by a company incorporated in Liberia to avoid all U.S. taxes. Obviously your masters degree and liberal education did not include much U.S. history in relation to U.S. central America interventionism. We have a deep historical connection to the DR and Haiti i.e. Military intervention as a means to political and economic exploitation. Experienced teabag activist Sarah Palin should not be discounted as a simplisitic air head. Sarah is able to see Russia from her verandah and, as a result, is experienced in foreign affairs and world matters. I agree with Duppy Lizard. I really don’t see the whole point of this. SLOW NEWS DAY at Barbados Free Press. Nothing to see her – move along now! If you get on a cruise ship and don’t where they are taking you then you definitely deserved to to be taken for a ride. Some people just let others think for them. Hispaniola is a Caribbean island. Haiti and the Dominican Republic are the two Caribbean countries that are located on that island. BFP is becoming more vain, more petty and more useless with every passing day. With a name like that you MUST be a politician and a lawyer. And with that double handicap it is only natural that you grasp onto little legalities and proffer them for truth. Yes, “Hispaniola” is the correct historical name for the entire island. No one uses that in colloquial conversation – as in “I’m going to Hispaniola next weekend”. They haven’t used that term in 100 or more years. “Hispaniola” is a resurrected historical word used by the cruise company to conceal the truth. They do that for a reason, ya know. And, SIR David… the truth is never petty.